The best time of the year to see Rukbat is around the beginning of July, when the star is at its highest in the sky. The map shows the view from Washington DC looking south at midnight on 4th July 2008 (remember that next time you're in the USA celebrating independence day). Rukbat is highlighted with the yellow lines. Everything with a grey background out is below the horizon and invisible. The bad news is that Rukbat is only visible from places south of 40 degrees north. That means south of Washington DC if you're in the USA or south of southern Italy if you're in Europe. Sorry, Rukbat is never visible from the UK, Norway or Netherlands . To get the best view you need to get as far south as possible. You can see from the above map that it's pretty close to the horizon from Washington and will probably be hidden behind a building, tree or mountain. The best strategy is to find a mountain top or south-facing coastal viewpoint. This is a real picture of the sky, not a computer generated image or simulation. I pointed my camera straight up and opened the shutter for 30 seconds. 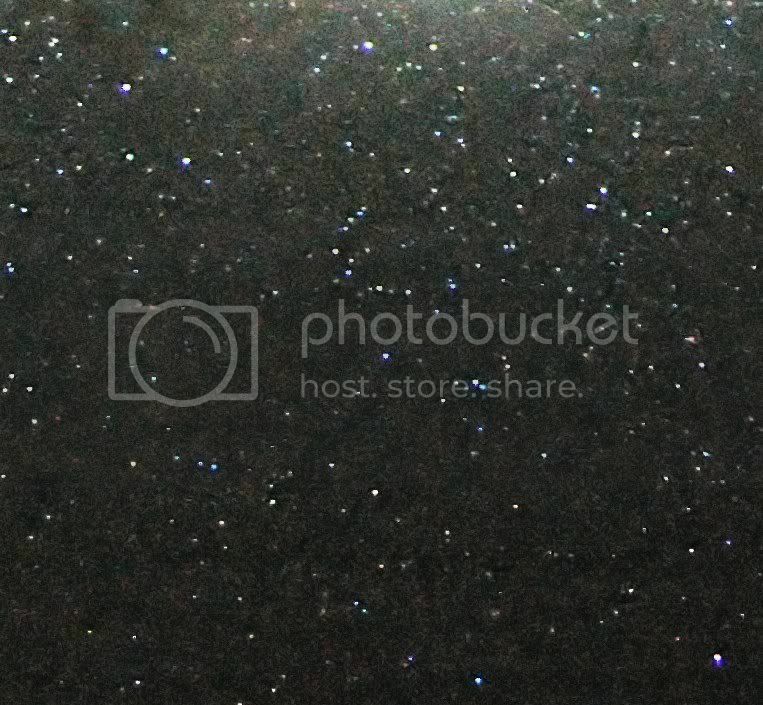 The Milky Way is passing right overhead, making the picture look like the photograph of an edge-on spiral galaxy (which is what the Milky Way is). The sky really does look like this when you can get well away from street lights, clouds and water vapour - hence the reason for siting an observatory at this spot. shows a close-up of the Rukbat part of the above picture. Rukbat is dead centre. Next, here is another variation on pictures of Rukbat. If you want to match this picture with the above picture taken with an ordinary camera, this picture needs to be rotated anticlockwise (counterclockwise) by about 90 degrees. 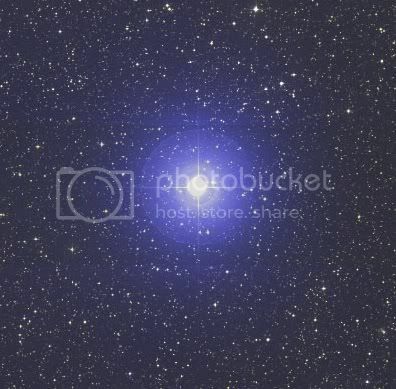 The picture here covers about 6 degrees on the sky - about the same size as Corona Australis. (with apologies for my "rabbit in the headlights" grin - it was a big occasion ). The picture is 4 years out of date but brought to you by the marvels of photobucket. Last edited by StevenB; Oct 7 2007 at 06:40 AM. The actual plates themselves are about 38cm x 38cm. 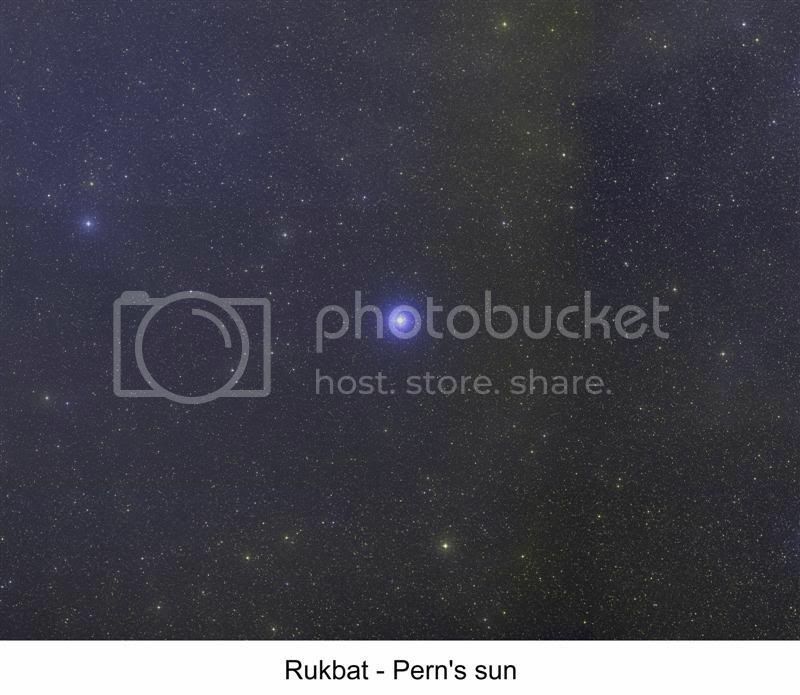 Rukbat is the brightest star on the plate, towards the bottom right. The copyright rules are the same as above. The pictures can be freely distributed as long as you mention they come from the UK Schmidt Telescope plate library. So, why am I telling you this? Earlier this year the UK Schmidt Telescope started decommissioning all the materials in the plate library which are now deemed to be out of date. In the era of digital images and data distributed by Internet, nobody wants to borrow photographic plates any more. The library are keeping all the original plates, but they decided to discard all the copy plates made in "uninteresting" areas of the sky. Guess what? The field containing Rukbat was classified as "uninteresting", so I put my name down and managed to get the positive copies made from the above red and green plates . 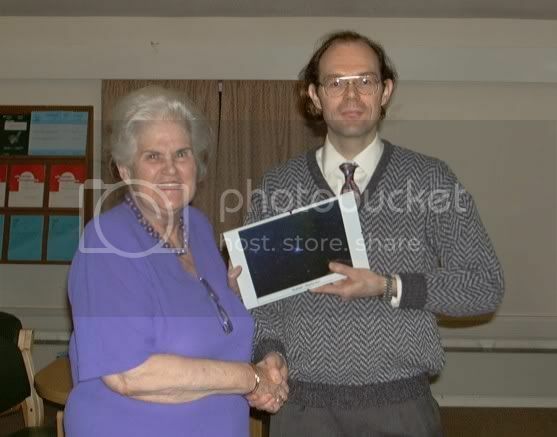 A few weeks ago we had a visit from Mike Freeman and Tania Opland, and I gave Mike the two Rukbat plates to take to Anne. (Mike is going to make Anne a light box so she can display the plates.) Anne told me at EuroCON that she had received the plates safely. So the UK Schmidt Telescope's loss is Anne's gain . It was wonderful to be able to acquire these plates for Anne. The above plates may end up being displayed on the wall at Dragonhold. Well, I've been monopolising this thread so far . Does anyone else have any interesting Rukbat pictures to post here? I'm totally dumbfounded by the (quality) of the pictures you took in Chile. Living and growing up near a city and much industry in a small polluted country certainly has its disadvantages! Could you please do so on map or photograph of Rukbat's "corner of space"? Thanks Hans. I should point out that the only picture of Rukbat I actually took is the one of the whole sky in Chile. The other pictures were taken professionally by the UK Schmidt Telescope. My contribution to the picture presented to Anne was merging, cropping, labelling and framing the existing pictures, and my contribution to the plates was saving them from being thrown in the skip . I must admit I was dumbfounded by the appearance of the sky in Chile. I'm glad I managed to capture at least part of its magnificence (but it really needs to be seen to be believed). So if you're planning a holiday somewhere remote, if you get a clear night try looking up at the sky. Could you please do so on map or photograph of Rukbat's "corner of space"
It's the picture I used to make my Avatar. 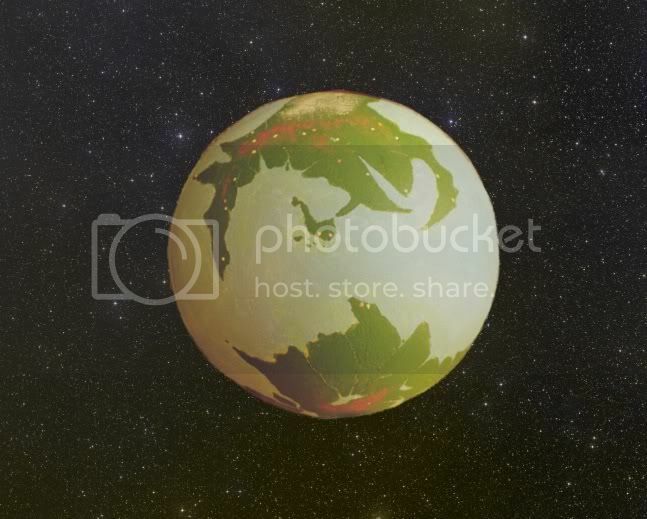 But I admit it shows Pern superimposed on Earth's view of Rukbat. By the way, I think further Rukbat art and pictures may need to be posted to a separate thread. It took ages to download this one when I revisited it. Apologies for the large pictures - I hope the download time is worth it. There are ways around that, when I can get my computer back on line. (My computer is off the Internet at the moment. I'm using Elizabeth's at the moment). And there's no real lag for wireless either, at least this time. *stares and stares and stares some more* Thanks for posting all these! And WOW that's a fantastic grab you got with acquiring that "uninteresting" portion of the sky. I think there was something wrong with our internet connection yesterday. My computer was off the network altogether and Elizabeth's was really slow. Today it's back to normal. I'm envious of your 22Mb connection, though. Ours is a meagre 0.5Mb , but fast enough for browsing when it's working properly. where you can access a wide variety of observations from different telescopes. The "Digitized Sky Survey" provides the same kind of pictures as the SuperCOSMOS sky survey above. You'll find high resolution images in the Hubble Space Telescope (HST) archive; but whereas the digitized sky survey covers everything, there's no guarantee that Hubble observed what you want to see. 19h 23m 53.2s -40° 36' 58"
These sites are mainly available for astronomers looking up information for research purposes, but the information is available to everyone. With these facilities you should be able to enter a keyword like "Rukbat" and find all the observations available. It's a great resource for getting the most use out of observations. I hope this helps you find some interesting images of Rukbat, or any other interesting object. Last edited by StevenB; Oct 8 2007 at 05:32 AM. I loved the pics., but some of them would not load for me. I did like the ones I was able to see. Thanks for the post. Wow, really cool. I am in Texas, so I am already planning for the 4th of July next year to be watching the sky!!! Steven - I've just had my once-a-month glance at Anne's own website and it seems as though she's put some pictures up from her trip. Steven - thank you so much for posting the pictures of Rukbat! I won't see it from where I live so getting to see your pictures was very special. Thanks again! OK, Steven, who'se death mask is the mask in one of the pictures? Sara, thanks for finding that link to Anne's site. I should have included that link in my first post but overlooked it. You can also see Pamela Melroy's picture of "The White Dragon" floating in the space shuttle. The death mask is Sir Isaac Newton's. During their visit, Anne and Col. Melroy visited the Crawford Library here at the Royal Observatory Edinburgh, which contains several historic documents, as well as the aforementioned death mask. Again, thanks for sharing all the great pictures! Like most others I can't see Rukbat in the sky (it just skims the horizon here, as I'm at 39.5 N latitude), so it's lovely to see a good star picture or two or three. Cheryl, Wow, you have some good Rukbat pictures on that page. (I like the little hand that rewards you when you find Rukbat ). 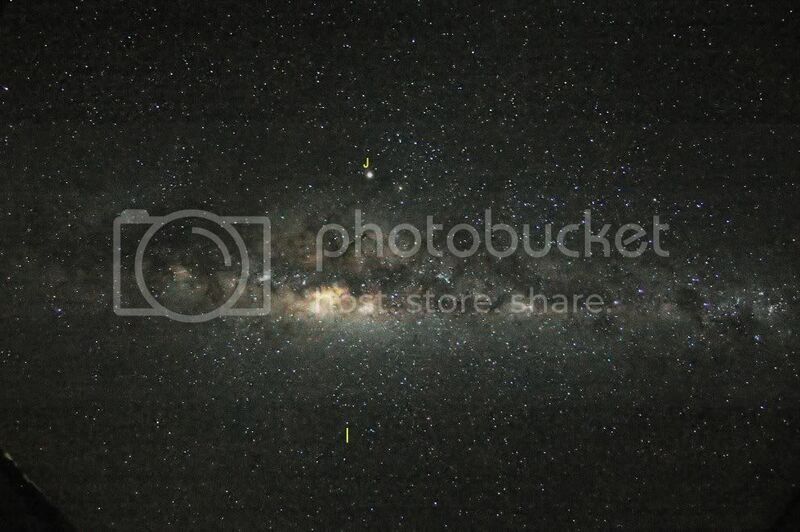 Where was the Milky Way and Sagittarius picture taken? That is a fabulous picture. You might want to update some of the words about the star map from the present to the past tense. Alas, the star map wasn't published with "The Skies of Pern". The Southern Cross from Pern becomes a little Southern Triangle. I never realised you were based at the ROE/UKATC, Steven! I used to visit there a lot - wave to Philip Best for me. Yes, I'm up here in the Scottish Place . Let me know if you're due to visit again. If you want to give a seminar up here on some interesting subject let me know and I'll pass your name on to Peder Norberg (who's organising the seminars at the moment), or you could email him yourself. I'll wave to Philip Best next time I see him. His office is on the other side of the site from mine. Nice to hear from you anyway. P.P.S. I had an interview at Sheffield once but decided to come to Edinburgh because there was a nicer view from the observatory . Yeah, the views from here aren't the best in the world! I work with Clive Tadhunter right now, but I agree that David's very entertaining. David's just retired though... he gave me loads of free books when he was clearing out his office. And by 'loads', I mean dozens!! There's a really cool astronomy program available for free called Celestia. It's open source, and people have made factual and fictional planet renders available, along with a huge star catalog of 2 million stars. Celestia add-ons here. Sadly there's no Pern done yet, but Hans, this program does what you want. for a view from Rukbat. The star marked with red in the center of the image is our very own Sol. I know, dear It's been on my computer for quite a while now and you know what's a funny coincidence, I have been discussing this particular program and it's quality (or non-quality?) with Steven during the weeks after Eurocon! Before capturing, try stepping up the magnitude, the stars will stand out better and will be more visible. I'm having fun with it, although I see what you mean about the magnitude. Still, it's pretty cool to see that the stars really look the same from any direction. That's great granath. Hans and I were talking about Celestia, as Hans says. There are some commercial programs (mentioning no names) which get their calculations wrong when you try and go a long way from our Solar System. But it looks like Celestia gets it right. 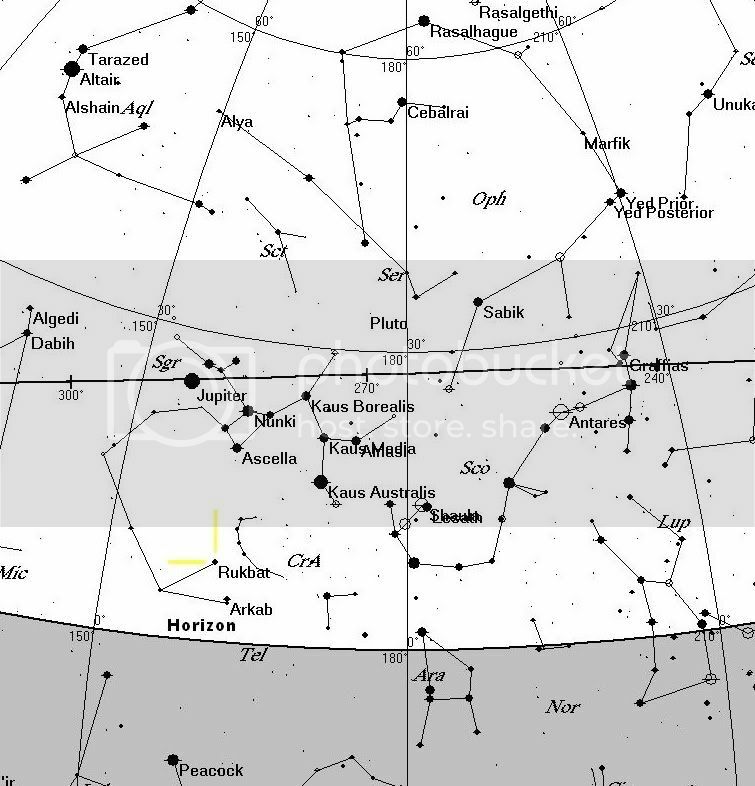 The Sun is an insignificant 8th magnitude star as seen from Rukbat - invisible with the naked eye but visible through binoculars. I do need to update that page. I thought the picture came from my college astro book, in which case I could look up the credits for it, but I've looked all through it now and not found that picture. I'm now baffled as to where I found it, because I was sure both sky pictures on that page came from my textbook. Isn't some of the stuff the same as I sent you years ago, Cheryl? Ummmm, I have no idea, been way too long. There's a really cool astronomy program available for free called Celestia. It's open source, and people have made factual and fictional planet renders available, along with a huge star catalog of 2 million stars. An update: Well, I never did get to see Mike's display boxes when I visited Anne this year. They were in Anne's office, which we didn't see much of (since we didn't want to disturb Anne when she was working). But the story of these plates continues. I have had some plates stored away for Mike and Tania for about 18 months as well, and Mike finally managed to collect his plates last week during their visit. I gave Mike a plate of the Small Megallanic Cloud (he wasn't expecting one as good as that ) and some of the Milky Way, and I am keeping the plate of the Large Megallanic Cloud and Corona Australis (the field next door to the Rukbat field I gave Anne). Mike has offered to make enough display boxes so that he and I can both display our plates.